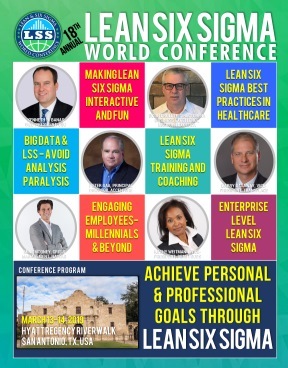 Lean Six Sigma World Conference - Jordan, Lois A. In her position as President and principal consultant for Transformation Technologies™, Inc., Dr. Lois A. Jordan provides training and consulting services in business performance improvement for a wide variety of organizations internationally. She is a course author and top-ranked national seminar instructor for the American Society for Quality (ASQ) in a wide variety of statistical, quality engineering, and business management topics, and has been the recipient of ASQ's Outstanding Faculty Award numerous times. She also teaches Lean Six Sigma Green Belt, Black Belt, and Master Black Belt courses for Villanova University’s Online Lean Six Sigma program, where she is the lead instructor for their Master Black Belt program. Dr. Jordan’s academic experience includes the position of Assistant Professor at the University of Tampa, where she has taught graduate and undergraduate courses in statistics, operations management, negotiations, management and business strategy, and the positions of adjunct instructor for both the Engineering and Business colleges of the University of South Florida. Dr. Jordan holds a Bachelor of Science degree in Industrial Engineering from the Georgia Institute of Technology, a Master of Business Administration from the University of South Florida, and a Ph.D. in Industrial Engineering with an emphasis on organizational effectiveness and applied statistical analysis, also from the University of South Florida. She also holds a Master Black Belt Certification from the University of South Florida MTEC. Dr. Jordan has more than 30 years of industry experience in all aspects of quality management, supplier quality management, process quality engineering, leadership development, and strategic management, and is a registered Professional Engineer (P.E.) for the state of Florida and an ASQ Certified Quality Engineer (CQE). She is a senior member of the American Society for Quality (ASQ) and has served as a member of the Board of Directors for ASQ’s St. Petersburg – Tampa section for many years. She has also served as a member of both the Board of Directors and the Quality Steering Committee for Northside Hospital and Heart Institute (HCA). Her academic honors include membership in Alpha Pi Mu (Industrial Engineering Honor Society) and Tau Beta Pi (The Engineering Honor Society). Since 1989, Dr. Jordan has been assisting organizations in achieving their business objectives through training and consulting in the use of quality management and industrial engineering principles and methodologies, including topics such as Six Sigma. Her customer list includes: AAI, ABB, the American Society for Quality (ASQ), Abbott Labs, Alcon, Andersen Windows, AT&T, Bayer Corporation, BB&T Bank, Becton Dickinson, Boeing, Capital One, Case Corporation, CertainTeed Gypsum, Chart House Restaurants, Coca-Cola, Compaq, Conmed Linvatec, the Defense Contract Management Agency (DCMA), Energizer, ETL, Fidelity Investments, the State of Florida’s Department of Labor, Florida Hospital, General Dynamics, Hitachi, Honeywell, Johnson & Johnson, JP Morgan / Chase, Kaiser Permanente, Kennedy Space Center, Kerry Ingredients, Lakeland Regional Medical Center, Leeds and Northrup, Los Alamos Labs, Lutron, Mannington Floors, Medtronic, Menasha Corporation, Mercury Marine, Moen, NASA, Naval Undersea Warfare Center, Northrop Grumman, Northside Hospital, NSTec, Oak Ridge National Labs (ORNL), Oshkosh, Pinellas County (Florida) Sheriff’s Department, Plant City (Florida), Polk County (Florida), Rockwell Collins, Siemens, Smith & Nephew, Sparton Electronics, Square D Company, St. Anthony’s Hospital, St. Joseph’s Hospital, St. Petersburg College, Tampa Electric Company, Transitions Optical, TRW, Unocal Oil, U.S. Homes, Villanova University, Volvo, Wachovia, West Pharmaceutical, Wyeth Ayerst Labs, and Zimmer.